January 22, 2018 – Wanted: college students to help NASA get to Mars. No prior Martian experience necessary. 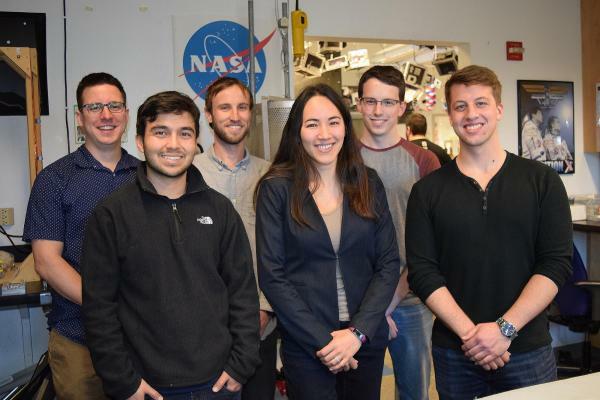 The space agency is turning to an unlikely resource in its quest to conquer the red planet, and University of Colorado Boulder students are answering the call. It is all part of the NASA BIG Idea Challenge college competition. Leading the charge at CU Boulder is electrical engineering graduate student Nick Glascock-Illescas. “They’re seeking proposals for an autonomously deployable solar array that can go to Mars and power a future manned base. These kinds of arrays been done before but never at this scale,” he says. Along with Glascock-Illescas, the five member team includes three aerospace students: Bryce Huber, Will Evonsky, and Clayton Cantrall, and mechanical engineering student Eric Robinson. The issue the students face is sunlight, and the fact that Mars just doesn’t get enough of it. The red planet is nearly 34 million miles (54.6 million km) farther from the sun than Earth. As a result more solar panels are needed. NASA is calling for an array with an area of 1,000 m2. It also needs to be able to fold up into a much smaller space for its journey aboard a rocket to Mars. One more thing – once the array is in use, it must be able to endure Martian dust storms of up to 100 mph. With a problem this complex, you might ask why NASA is turning to fresh-faced students for potential answers. While the space agency has teams of experienced engineers, team adviser Kyri Baker, an assistant professor in the Department of Civil, Environmental, and Architectural Engineering, says experience is exactly the problem. “When you work in the field a long time, it’s harder to think of fresh ideas. NASA’s trying to harness new creativity,” Baker says. So far, NASA likes what it’s seeing. After submitting an initial white paper of their proposal, team CU Boulder was announced as one of five finalists and awarded $6,000 to continue design work. “We went through multiple ideas early on, pitching them to a professor who had worked in deployable space structures. He had doubts about each of them, which was discouraging because it felt like we had wasted time just coming up with them, but we’ve now got a plan with real potential,” says Glascock-Illescas. It’s called the Mars Autonomous and Foldable Solar Array, or MAFSA, and it utilizes flexible booms wrapped around a central hub to support four large solar arrays. For the next stage of the competition, the team is hard at work refining their idea into a 15-page technical paper, CAD drawings, and a scale model. In March, they’ll travel to NASA Glenn Research Center in Ohio to present their proposal.